Gwyn Roberts, a founder member of the reformed Cor Meibion Colwyn in 1972, was appointed as Musical Director in 2000. Under his direction the choir has developed close connections with the local community as well as undertaking a range of concert tours in England, Ireland and Spain. 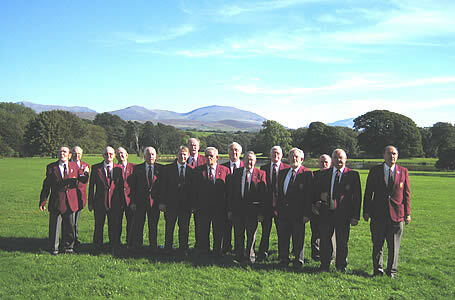 In 2001, we had a very successful tour of the Lake District, culminating in a concert at St Johns Church Keswick. We have built up links with Bands in Lancashire and choirs in Yorkshire and have undertaken a number of short tours. We have also undertaken a range of commercial bookings and conference concerts for a wide range of organisations, including an International event at the Leeds Armoury Museum. A new CD was recorded in 2003 called ‘O Gymru’ (O Wales), featuring 17 songs from the choirs repertoire, and is available to buy directly from the choir. 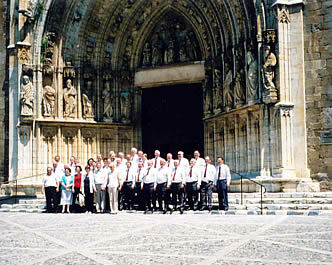 The choir went on a tour of Catalunya, Spain in 2004 singing in Barcelona, Bescano, Roses and Castello d`Epuries. 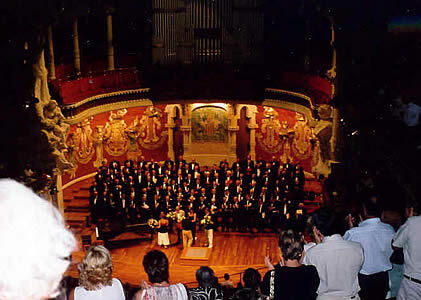 Special highlights of the 2004 were a concert with the Preludi Ladies Choir in Bescano near Girona and in Barcelona in the Sant Pere de Pel-les Church in the old Gothic quarter of Barcelona, close to Las Ramblas and in the centre of Barcelona. 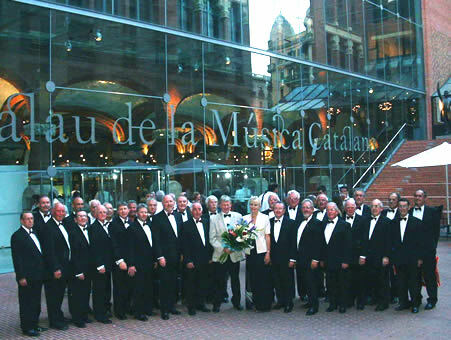 In 2005 we were the only UK based choir to be invited to sing at the International Festival of Male Voice Choirs in Barcelona. Later in the concert we were joined on stage by the Cor Santa Lucia from the Basque Region of Spain and the Spevacky Slovak Teacher’s choir from Slovakia. This is the finale of our concert in this wonderful concert hall, which was designated a UNESCO World Heritage Centre in 1997. The Palau de la Musica was designed by Lluis Domenech I Montaner and completed in 1908 and hosts concerts to over 500,000 concert goers a year. In 2006 we had a very successful tour of the Lake District with a concert in Keswick, gave a concert in Venue Cymru (1400 seat North Wales theatre). Other highlights included recording for Italian TV and BBC Wales TV, as well as Joint concerts in the Rhyl Pavilion Theatre. Also in 2006 we sang at Y Faenol, near Bangor .. the venue made famous by the series of concerts given by Bryn Terfel and international guest artists. 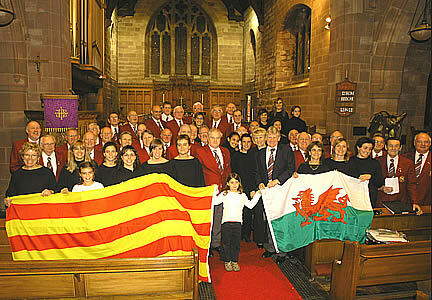 In December 2006, we invited the Preludi Ladies Choir to return to sing to with us in Old Colwyn.